Having chickens in the city is an amazing process. First, there's the contemplation stage. When you're "thinking about" getting chickens, you start discovering all the people who DO have chickens, who you never knew had them. You begin connecting, and sharing stories. You begin visiting a few city chicken homes, and learning. We went into deep contemplation at this point, and spent nearly a year still "thinking about it," but taking no real action. We read a few chicken books, but didn't do any building or anything specific. Then one spring day, you break through the inertia. You decide to go for it. We did a few casual measurements, made a few phone calls to suppliers, and suddenly the feelers we'd put out over the past year all came in. We found a used rabbit hutch on Craig's List which my son could remodel. 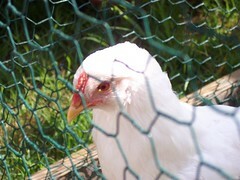 My sister had discard construction parts which worked fine as a chicken playpen. Suddenly we were in business. Our girls came home about 2 weeks ago. They're lots of fun to watch. My niece refers to it as "watching the Chicken Channel." Patricia Foreman refers to it as "working out chicken politics." Our girls were accustomed to eating only pellet food. We had to teach them that, yes, chickens do indeed eat green vegetables. At first we minced them, and then gradually increased particle size. Now they can cope with whole leaves of most veggies. Note here, though, that our chickens "range" in their moveable playpen -- they don't have free range of the vegetable garden. Our friends did that with disasterous results, and no longer have any garden left, the chickens ate everything. Chickens are changing my perspective. While weeding the community garden, I found myself thinking "the chickens would like this" as I pulled old leaves of chard. It suddenly seemed like a waste to put such great food into the compost pile! Rob Hopkins has been exploring the Pattern Language on his blog and in his recent work. Suddenly I am seeing a pattern language in my own waste stream. At first we move away from mainstream throw-it-away, and we begin to separate out our recyclables. Then we learn that, better than recycling, we can Reduce the amount of waste we generate in the first place. When we bring a composter into our lives, we begin extracting our vegetable trimmings from the mess, and we reduce our waste stream still further. Now we begin to appreciate what "rich garden soil" really means, and our garden explodes into productivity. Perhaps we try worm composting as well. Suddenly our waste stream is divided multiple ways: worms, regular compost, recyclables, and the other stuff. The other stuff is getting smaller all the time. So is the amount we need to haul home. Chickens bring in a whole other dimension. Now they're getting our prime garden scraps. Compost worms are getting what the chickens can't take, and the regular composter is getting yard trimmings plus chicken bedding. The compost goes to the vegetables, which we (and the chickens) then eat ... The pattern is deepening.